Editor’s note: We here at oprainfall are well aware that this may not quite be the review you were hoping for, but, while we still work through the 3DS version of the game, we thought Mike’s Retro Review of the original N64 title would make a fine substitute! Just what kind of game can follow up a legendary title like The Legend of Zelda: Ocarina of Time? The developers at Nintendo EAD were faced with this very question. Ocarina of Time would be a hard act to follow! Director Eiji Aonuma stated that they were “faced with the very difficult question of just what kind of game could follow Ocarina of Time and its worldwide sales of seven million units?” The solution they came up with involved the famous three-day system used in Majora’s Mask, which allowed for more compact game data while still providing a deep gameplay experience. By reusing the game engine and some art assets from Ocarina of Time, Nintendo was able to develop Majora’s Mask with a much smaller team in a much shorter time span (one year compared to the four years of active development that it took to make Ocarina of Time). 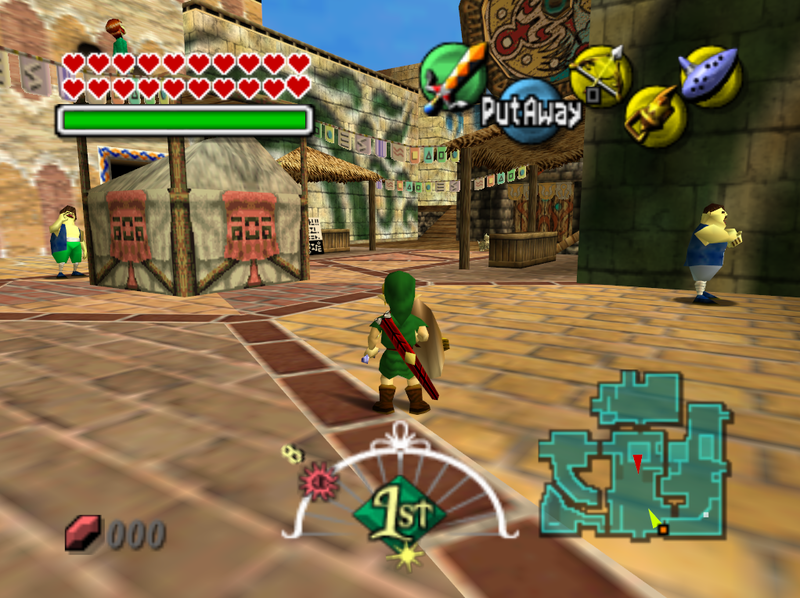 Along with an improved version of the Ocarina of Time engine, the game uses the Nintendo 64’s Expansion Pak, which doubled the console’s memory from 4Mb to 8Mb. The Legend of Zelda: Majora’s Mask turned out to be one of the most unusual adventures ever to hit the Nintendo 64, but it was also an excellent game. Link sets out to find a beloved and invaluable friend. The Legend of Zelda: Majora’s Mask takes place shortly after the events of Ocarina of Time, with Link leaving Hyrule in search of a beloved friend with whom he parted ways after his quest as the Hero of Time was finished. 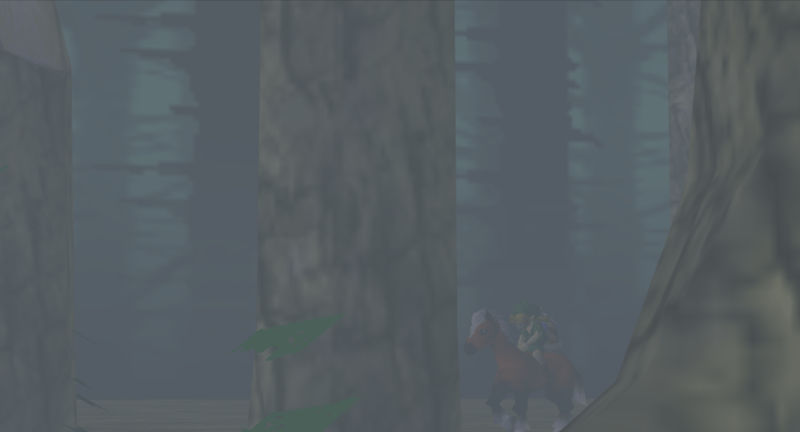 The game begins with a cutscene of Young Link and Young Epona walking at a leisurely pace through the woods of Hyrule. Two fairies appear and startle Epona, causing the horse to buck. Link is thrown off the back and lands on the ground, knocked out cold. The dreariness of the woods foreshadows the coming evil, as the Skull Kid makes his appearance. Majora’s Mask floats ominously in the air as the Skull Kid’s body begins to materialize below it, and a sinister melody plays. He then approaches Link, who is still motionless on the ground, knocked out from his fall. Skull Kid helps himself to Link’s Ocarina of Time, but our hero begins to rouse and catches him in the act. 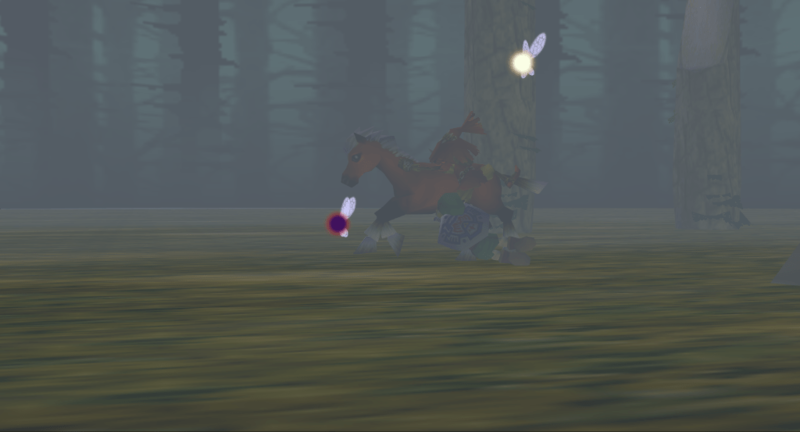 Attempting to make a quick escape, the Skull Kid leaps onto Epona and tries to speed away. Link quickly grabs onto Epona and gets dragged along behind the horse until his grip finally fails him. Link tries to hold on to Epona, but his grip finally fails him. Link wanders ahead to find them and enters a cave where he falls down a deep pit. The Skull Kid is waiting at the bottom, where he now mocks Link and then puts a curse on him that turns him into a Deku Scrub. The Skull Kid then exits, accidentally leaving behind one of his two fairies (Tatl, who was mocking Link as her brother, Tael, left with the Skull Kid), and the stone door slams shut. Tatl, having no other choice, sticks with Link and apologizes for being a little jerk. Link wanders through the cave and comes out in the basement of the Clock Tower, finding himself in a new world known as Termina. A familiar man suddenly speaks from behind Link. It’s the strange Mask Salesman from Hyrule Castle Town in Ocarina of Time. “You’ve met with a terrible fate, haven’t you?” he says. 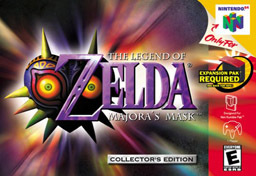 The Mask Salesmen tells Link of the dark nature of Majora’s Mask, and that it was used by an ancient tribe in their hexing rituals until it was sealed away because of its terrible, dark power. The Mask Salesmen also says that he can return Link to his normal form if he can get back his Ocarina of Time, but that he MUST get back that mask, too, or terrible things will happen. This is where your adventure in Termina begins. Link finds a Skull Kid drawing in Termina Field. 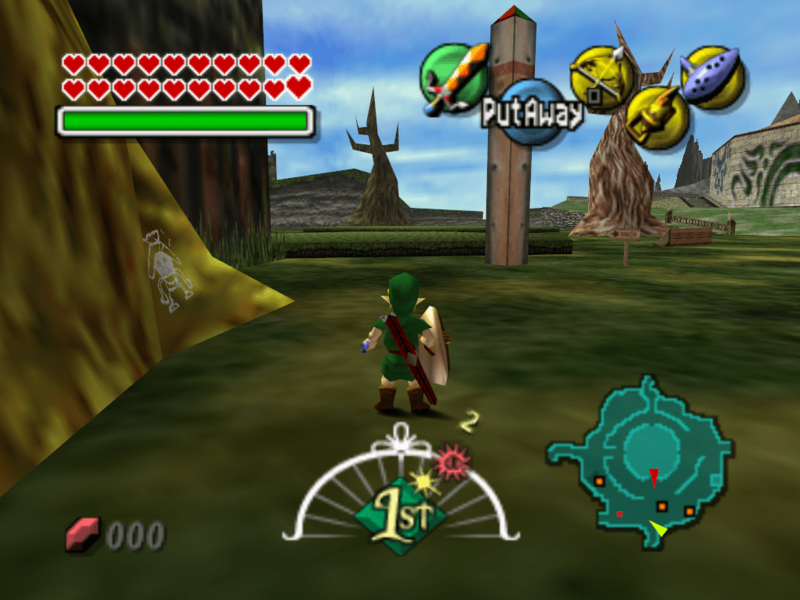 Like Ocarina of Time before it, Majora’s Mask controls quite well. Running around and using items is quite easy to do. Only being able to equip three items at a time can be a minor annoyance in a few places, but, beyond that, this is not a problem. You will spend most of your time with the game focusing on the gameplay rather than the controls, which is as it should be. The part where Majora’s Mask really differentiates itself is with the three-day time cycle. You have three days to save Termina before the moon (under control of the Skull Kid) pummels it into oblivion. Luckily, Link can play the Song of Time once he gets his ocarina back to reset to the morning of the first day, which allows him to effectively have infinite time to complete his quest before the moonpocalypse befalls Termina. Meanwhile, the citizens of Termina are in different places doing different things depending on the time and day in the game world. It’s a unique system and makes for some very interesting gameplay possibilities. This means that you can’t do some things whenever you want, but, rather, you need to do them at the correct time frame in the game world. That might sound like it could be annoying, but Majora’s Mask gives you two hidden variations on the Song of Time. The Double Song of Time moves time forward to the following dawn or dusk (whichever is closer), and the Inverted Song of Time slows down the flow of time (making it take much longer for the three days to tick away). There is always stuff happening in the small-yet-bustling community of Clock Town.